Place bison, spinach, feta, 2 teaspoons dill, oregano, cumin, garlic, 3/4 teaspoon salt and 1/2 teaspoon pepper in a large mixing bowl. Gently combine without overmixing. Form into 4 oval-shaped patties roughly the size of the rolls. Oil the grill rack (see Tip, below). Grill the burgers until an instant-read thermometer inserted into the center registers 155°F, 5 to 6 minutes per side. To prepare yogurt sauce: Combine yogurt, lemon zest and juice, 1 teaspoon dill and mint in a small bowl. Season with a pinch of salt and pepper. 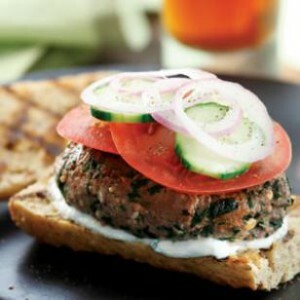 Assemble the burgers on rolls with the yogurt sauce, cucumber, tomato and onion.